Melatonin is a hormone that both pets and humans naturally produce in their bodies. It is often taken in the form of a supplement. Melatonin can help people and pets de-stress and relax, and is often used to treat certain medical conditions. It is a good idea to consult with your dog’s veterinarian before you give your pet melatonin or any other supplement. When melatonin is used in the proper way, it can be beneficial for a number of health conditions. Melatonin is often given to dogs that have anxiety or depression as it has a calming effect. Melatonin can be particularly beneficial for canines that suffer from separation anxiety. A dog may have separation anxiety if they are left alone for long periods of time. 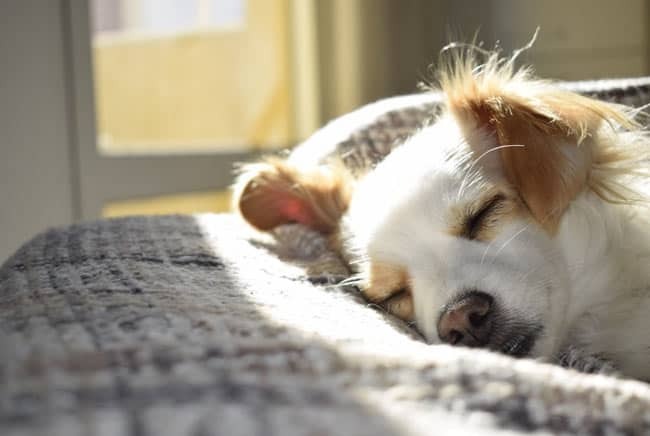 So you can give melatonin to your dog before you leave them for any significant stretch of time or if they’re likely to encounter a stressful experience, such as a visit to the groomer or a long road trip. Melatonin can regulate many of the processes that go on inside of your body, such as distinguishing between day and night, or when it’s time to play and sleep. Many people take melatonin because they suffer from jet lag after traveling. It can also be beneficial for older dogs. Older dogs are more likely to have cognitive problems that make it harder for them to sleep. Cushing’s disease is a condition where the body produces too much cortisol. It is caused by a tumor on the pituitary gland. A tumor on the adrenal gland can also cause Cushing’s Disease. Melatonin can decrease the amount of cortisol that is produced by the adrenal gland. There are some drugs that can be prescribed to treat Cushing’s Disease. However, they often cause severe side effects like diarrhea, vomiting and kidney failure. If a dog has moderate or severe symptoms, then drugs may be necessary. In some cases, surgery is necessary to treat this condition. Cushing’s disease is a risk factor for anesthesia-related issues, so pairing or even replacing treatment with melatonin can often be beneficial. Melatonin can also be perscribed to dogs that suffer from seasonal alopecia, often referred to as flank alopecia. It causes a dog to develop bald patches on their abdomen. No one knows what causes alopecia, nor how melatonin can help dogs that suffer from alopecia. They also don’t know if the condition will actually go away without the melatonin. However, dogs still seem to benefit from using melatonin, and there is little risk in trying. It is important to consult with a veterinarian before you give your dog melatonin. A veterinarian can determine the proper dosage. Your dog’s size is one of the factors that will determine how much melatonin they need to take. Dogs that weigh less than 10 pounds are typically prescribed less than 1 mg. Dogs that weigh between 10 and 25 pounds 1.5 mg, and dogs that weigh 26 to 100 pounds approximately 3 mg of melatonin. And when a dog weighs over 100 pounds they are typically prescribed between 3 mg and 6 mg.
A veterinarian will likely tell you to not give your dog melatonin more than three times a day. Melatonin is available in liquid, tablet, capsule or powder form and can be taken with or without food. In most cases, the melatonin starts working within 10 to 15 minutes. The effects of the melatonin can last for up to eight hours. This is why many people give their dogs melatonin before they go to sleep. When melatonin is taken as prescribed, it is not likely to cause any side effects. In fact, one of the reasons why many dog owners give their pets melatonin is because of the low risk of side effects. However, there are still a few side effects dog owners should watch out for. If your dog experiences any side effects your veterinarian may prescribe a lower dosage. They may also recommend that you give your dog something else to treat their anxiety. The following are potential side effects you should look out for. Drowsiness is another potential side effect. Your dog may feel lethargic after taking melatonin. There’s also a chance that melatonin will cause insulin resistance, a condition where the body cannot absorb insulin. When insulin resistance isn’t treated, it can potentially lead to high blood sugar levels. There is also the possibility melatonin could cause an allergic reaction. While she’s allergic reactions from melatonin are rare, it’s a side effect of which dog owners should be aware. You will need to read the ingredients of the melatonin you’ve purchased before giving it to your dog. Xylitol, an artificial sweetener found in some melatonin products, can be toxic to dogs. It’s also important to note that melatonin can also interact with certain medications. These are all things you should discuss with your dog’s veterinarian before giving them melatonin. This supplement typically isn’t recommended for puppies, nor is it recommended for pregnant dogs or those nursing puppies.